Planet Hugill: Contemporary works in all-women gala for SWAP'ra at Opera Holland Park. Contemporary works in all-women gala for SWAP'ra at Opera Holland Park. Extracts from operas by five contemporary composers will feature alongside music from well-established classics in SWAP'ra's gala at Opera Holland Park on 31 July 2018. A series of semi-staged scenes will be presented by a remarkable all-women ensemble, with 40 soloists from rising stars to long-accomplished artists, four women conductors conducting an all-women orchestra and eight women directors. The contemporary music featured will include the UK premiere of an extract from American composer Mark Adamo's Little Women, plus music from Roxanna Panufnik's Silver Birch (premiered at Garsington Opera last year), Elena Langer's Rhondda Rips it Up! (premiered by Welsh National Opera earlier this year, see my review), Josephine Stephenson's Les Constellations - Une Théorie, and Lucy Pankhurst's The Pankhurst Anthem (commissioned by the BBC in celebration of the centenary of the first UK Women's Suffrage bill in 1918). The gala will also feature music from Mozart's Le nozze di Figaro, Puccini's Madama Butterfly, Britten's Peter Grimes and Tchaikovsky's Eugene Onegin. There will be a remarkable line-up of performers including Giselle Allen, Jenni Bern, Mary Bevan, Lee Bisset, Rebecca Bottone, Katherine Broderick, Rebecca Caine, Anna Devin, Anne Sophie Duprels, Yvonne Howard, Jennifer Johnston, Fiona Kimm, Gillian Keith, Janis Kelly, Diana Montague, Anna Patalong, Madeleine Pierard, Meeta Raval, Amanda Roocroft, Lucy Schaufer, Helen Sherman, Angela Simkin, Sarah Tynan, Kitty Whately, and Catherine Wyn Rogers, with conductors Jessica Cottis, Alice Farnham, Sonia Ben Santamaria, Susannah Wapshot. 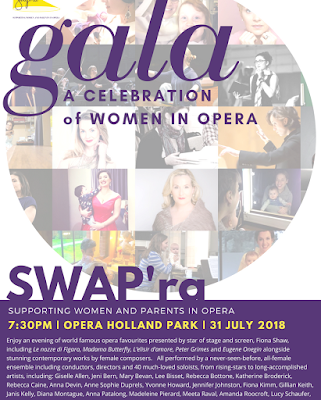 The event is a fund-raising gala for SWAP'ra, the new organisation founded by five women working in opera and the money will go towards the organisations aims to support women and parents working in opera [see my interview with co-founders Madeleine Pierard and Sophie Gilpin]. Full details of the gala from the SWAP'ra website.